Since I moved to HKT I've been experiencing problems with page loads on the forum. I've been in 3 different apartments here in Kamala Hills with 3 different adsl internet connections and 3 different wifi routers - probably the same ISP though. I use Chrome on a 2 yo MacBook Air to browse the forum. The issue is worse some days more than others. It's not so bad on the front page (though it's not immune from it) but more noticeable when navigating within a thread. I didn't use to get this with my adsl2+ connection back in Melbourne but do I get it here in HKT. I've thought about modifying my hosts file to point the 4 offending URLs to the loopback address 127.0.0.1 but I guess that would detract from forum income. Last edited by Nubbins; 5th October 2013 at 21:05. Here's another one - it just happened on the front page. Last edited by Nubbins; 5th October 2013 at 21:16. Have you tried logging on to the forum in "Incognito Mode"? See if it hangs then? It does sound like one of your add-ons is an issue though... as I have found this forum loads faster than almost any other forum I am on. I get these "waiting for page..." things.. Only they go so fast I can't read them..
Have you tried an add-blocker? Yes exactly correct - that is the number of webpage tabs I had open in Chrome. You counted from the screenshot right? I am trying the incognito mode now - pity it makes a whole new window rather than a new tab. An ad blocker would do much the same thing as modifying the hosts file, I suspect. Last edited by Nubbins; 5th October 2013 at 21:49. ^^^^^ Definitely a good idea. "doubleclick" is basically a spy-ware company that gathers stats from your browsing habits, which allow website advertisers to tailor their ads to what they interpret as your personal interests. They have been around since the mid-90's and were purchased by Google in 2007. Without proper spam protection, including a good ad-blocker, your surfing can be slowed to a crawl. So far the incognito mode seems much faster overall and no page hangs. Maybe I'll load up my 14 other tabs on it. This page just hung on yui.yahooapis.com. Last edited by Nubbins; 5th October 2013 at 23:07. I just did the hosts file update for those 5 URLs and I'm back on the normal (not incognito) Chrome window. Wow - it's loading like a rocket now - faster than ever - but the adverts have disappeared from the top and bottom of each page. Mods - please feel free to delete this thread if what I've done goes against the forum objectives. Last edited by Nubbins; 5th October 2013 at 23:11. I haven't seen the forum this fast since I was last in Melbourne. Sorry to say it but I don't miss the adverts. I suspect this particular ISP is throttling bandwidth to the advert URLs. It seems I'm with 3bb.co.th. I have always had 3bb here...over the years its improved and now 10mB for the 690Bt. It rarely gets better than 1mB international. 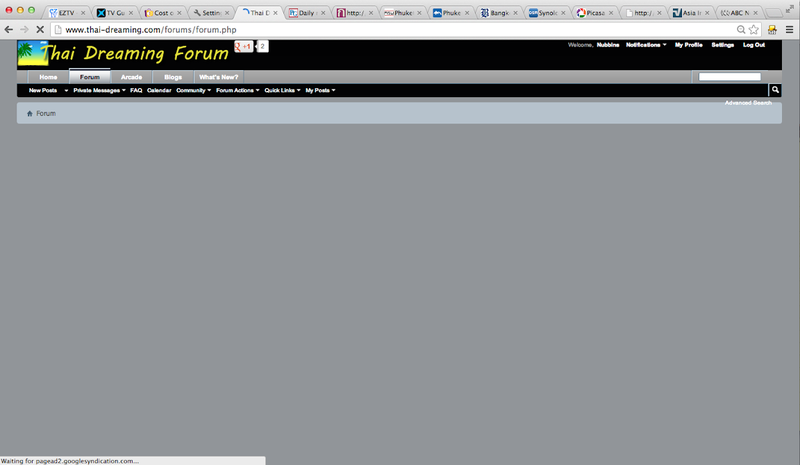 I do not have a problem with page loading on this forum, nor the oppositions. My internet connection is much slower than Chob's. It's probably one of 3bb's cheaper offerings as it's included in my base rental. I don't pay separately for it. However, now that I have pointed the advert URLs to the loopback address in my hosts file, the page loading response on this forum is terrific. The adverts have disappeared top and bottom but frankly I don't miss them. I half expected to see broken image symbols in the advert positions but instead it is just clean blue/grey background colour where the ads used to be. Last edited by Nubbins; 6th October 2013 at 13:46. I presume you are running some kind of ad blocker Baz. I just rolled my own ad blocker by changing how the DNS (domain name system) works on my PC. Now whenever my PC is asked by TD to find the internet address (IP address) of those advert website names, it has been told that their IP address is 127.0.0.1 which is the address of the PC's own internal system. Therefore, it doesn't even try to find the advert address out on the internet because it already knows the answer - but 127.0.0.1 has no content. Last edited by Nubbins; 6th October 2013 at 20:43. 3BB are less than straight up with their marketing. They offer a 10mb line @690 + tax, what they don't tell you is how many people you share with or what the international speeds are, it's a bit of a lottery. I pay 963 inc tax for a 13mb line and it is very good when they aren't throttling it back which they do as is evident in my torrent download speeds. Still most of the time I can get 1.1 mb download which is the best I have ever had on ADSL.